When most players go paintballing the piece of equipment they are interested in the most is the paintball gun, or marker, as it’s also known. The paintball gun you receive on the day will vary from centre to centre, however you can rest assured that it will offer serious accuracy and firepower. 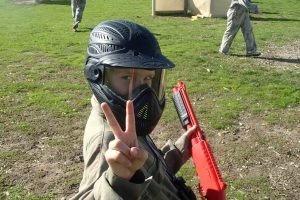 At all times when handling the paintball gun you will need to adhere to the safety rules and regulations of the paintball centre. These are high-powered guns that are safe to use in purpose built paintball arenas, however can become dangerous when people do not follow the safety instructions. The paintball gun will generally be a semi-automatic and velocity-tested to adhere to safety regulations. The most commonly used paintball gun in Australia is the Tippman 98 or the more superior Inferno Mk II. With paintballs travelling at speeds of up to 300 feet per second it is essential you wear appropriate paintballing equipment. All AUPBA-approved paintball centres offer this equipment so that your next paintball adventure is played in more comfort and safety than ever before. For obvious reasons, paintball guns are not allowed in the ‘safe zones’ of the paintball centre i.e. the base camp. The paintball guns also have a safety catch, which should be enabled when walking to and from the game scenarios. During these times you should also hold the paintball gun by the handle. That way no shots can accidentally go off and shoot your teammates. 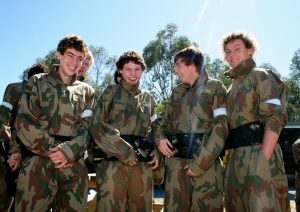 Once you are out in the game zone, release the safety catch and enjoy the fun and exciting sport that is paintball!